Salyn Sarethi is a Dunmer buoyant armiger. He claims that the Imperial Legion has no courtesy. 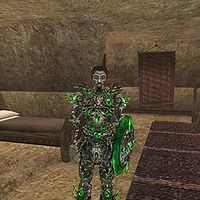 He is also the rightful owner of Enamor, a blade that was given to him by Vivec. He can be found on the lower level of the Tower of Dusk at Ghostgate. Sarethi wears a glass cuirass with matching pauldrons, greaves, boots, and shield along with an expensive shirt with matching pants. He carries a glass jinkblade and a pair of expensive shoes. Aside from his natural resistance to fire and the sanctuary provided by his ancestors, he can cast the spells Daedric Bite, Lightning Storm, Lightning Bolt, Temptation, and Wild Torpor. "Yes, I said that the Legion has no courtesy, wit, poetry, or honor. I will concede that you have wit and poetry if you win a contest of riddles." "Yes, I admit I was wrong. You have proven to me that the Legion has courtesy." Salyn Sarethi also appears in the Houses of Morrowind card expansion for Legends as the card Enamor's Keeper. This page was last modified on 11 March 2019, at 19:51.